Files protected with Seclore can be easily accessed and utilized by employees and external third parties alike – on a full range of devices – via a browser – making use of enterprise digital rights management a breeze. A robust identity federation capability enables recipients to authenticate using a wide variety of SSO, directory, and social media sources including their Google identity. And if all else fails, Seclore has a built-in identity manager for recipients who are unable to use other methods. Making it easy for recipients to utilize protected files on the device of their choice with minimal friction is the key to successful adoption of digital rights management. The Seclore Lite product line is designed with the business user in mind, making it very easy to utilize protected documents through a browser or light-weight agent. Designed for the power user, the Seclore Desktop Client enables protectors and recipients to take advantage of the full range of Seclore’s capabilities. A secure online viewer for accessing protected files in any browser, Seclore Lite Online offers a complete, agentless, digital rights management experience. A light-weight agent, Seclore Lite for Windows can be installed without any administrative privileges. Recipients can easily access protected files via their mobile devices using free apps. Users can now engage in secure collaboration using their Mac desktop devices. Our most robust client – Seclore Desktop allows the full range of document protection and usage capabilities including support for all file formats, manual protection of files, and support for all activities on protected files (where permissions have been granted). See how Seclore enables you to use rights management across a variety of devices with minimal effort, including a completely browser-based experience. 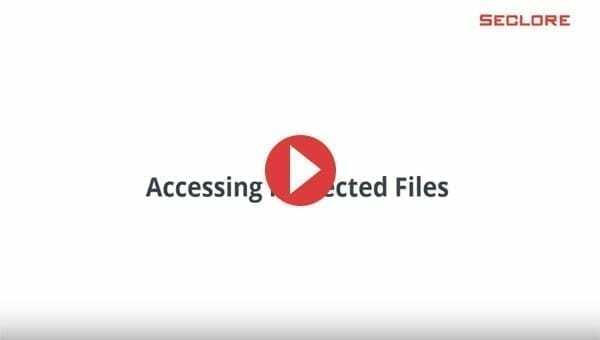 See how the lite agents makes it easy for users to quickly utilize protected files from their desktop of choice. Access and utilize protected files without an agent. Access and utilize protected files from your iOS and Android devices.